To make a gem elixir, select the stone or stones that are suitable for the issue that you need to address. It’s advisable to meditate first to receive guidance and permission from the stone to be used. Clean your crystal or stone and place in a clear glass bowl or container and fill with pure water. Place the bowl outside in the sunlight from 2 to 4 hours. Cloudy days are not suitable for making gem elixirs. The water absorbs the crystal’s power and vibrations. To keep the crystal energy from absorbing your own energy and affecting the elixir, place and remove the stones with a spoon rather than handling them directly. Be sure that you are in a calm and focused emotional state when making your elixir, strong emotions can affect the quality of the elixir. After the water has been charged by the gemstone, it is filtered and usually preserved with alcohol or vinegar. To preserve an elixir, fill a container halfway with your essence and fill the rest of the bottle with brandy or vodka or with vinegar or with half vinegar or alcohol and pure water. The alcohol or vinegar is used to inhibit bacterial growth and will help to “fix” the vibration of the elixir. Gem elixirs are often used by drinking glasses of the charged water, or by placing two to five drops of the elixir in a glass of water or under the tongue two to four times a day. They can also be used topically on the skin or put in bath water. You can add them to sprays that you use for room or aura clearing. Some stones can’t be soaked in water, so alternative methods are then to be used to make elixirs. Place stones around the container being charged. These two methods are often used in combination. Some sources recommend that you have at least six stones of the same type to place around the container, others use quartz points to amplify and direct the energy of the stone you are making an elixir with into the water. WARNING! Be careful regarding drinking gem elixirs which have been made by soaking gems in water. Some crystals are toxic, make sure that it’s safe before you use it. Water can leach toxic chemicals from the gemstones. Toxic gemstones include but are not limited to, Copper, which would include azurite and Malachite. Orpiment is arsenic and Cinnabar contains Mercury for example. 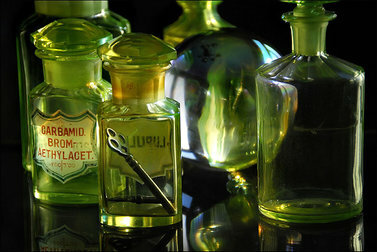 To make elixirs from toxic gemstones use the non-soaking method described above. The list below provides some descriptions of the uses for several gem elixirs. for the use of gem elixirs. Consult gem properties lists and especially your intuition for other uses. Different sources of information often vary greatly as to the purpose the elixirs are used for. Abalone shell: treats excessive anxiety and fear for others. Also helps psychic connection with water element. Amethyst: For those who strongly resist any interference with their freedom to make their own decisions and plans. Raises vibration to more spiritual level. Aquamarine: over enthusiasm, tenseness, stress and strain. Brings a calm, quiet clarity to an over active mental body; increases one's ability to achieve a neutral, serene state of mind. Aragonite : overcoming a feeling of helplessness. Aventurine: mental rigidity, high mindedness, pride and aloofness. Strengthens and stabilizes us during growth experiences; helps us move into and through new experiences with grace, stamina and perseverance; good for spiritual trailblazers and pioneers. Azurite: grounding communication; opens and strengthens the connection between the feminine earth forces. Helps us communicate with authenticity, gentleness. For those unable to control their own reality. Black Tourmaline: helps us exchange old unwanted energies for fresh, clean, neutral energy; a precision tool for the release of toxic energy from the mind, emotions, and especially the physical body. Offers protection and grounding. For restlessness. Bloodstone: strengthens our connection to the earth; brings a stronger flow of earth energies. Aids in stability after trauma or emotional upset. For those who demand unquestioning affection. Carnelian: increases the etheric body's ability to access spiritual energy; energizes and clears the energetic interface between the etheric body and the meridians, allowing a greater flow of energy to the meridians. Chrysocolla: opens, softens, and expands the inner dimensions of the heart chakra; helps us release tension and armouring around giving and receiving love; increases flexibility in the mind and body to allow the vibration of love to flow. For those stuck in an over organized life routine. Citrine: harmonizes the mental body with higher spiritual laws; increases access to divine truth and intelligence; amplifies qualities of concentration, centring, and rational mind. Emerald: a universal heart cleanser and balance; energies of the Divine Mother and the Divine Feminine; gently coaxes the heart to open to allow a greater experience of love in the physical body. wisdom as a source of creative power. restores earthly sensuality and healthy sexuality. in the emotional body; promotes emotional independence rather than co-dependency; helps us maintain a state of compassionate detachment while witnessing an intense emotional experience in another, and contain our own emotional experiences in a responsible way. Jade: For those who require help in being realistic about their ideals. For becoming the practical mystic a vibration of peace, balance, and timeless simplicity; helps us stay centred in the moment with an awareness and acceptance of our true essence. Lapis Lazuli: amplifies the ability to hear information from physical and non-physical sources; clears confusion between hearing and knowing. Malachite: For those striving too hard to control their reality. Grounding; helps align and harmonize the physical, emotional, mental, and spiritual levels of being; supports the unity of one's being in all circumstances. Do not take internally. Moldavite: connectedness; an energetic window into universal perspective; helps us stay present in the moment while accessing what we need to express our earthly potential. by their environment. For the reckless spending of money. Moss Agate : For repressed sexual feelings. suppressed agitation from attempting to resist and form of stimulation. Pearl: promotes the release of layers of irritation in the mental and emotional bodies that are seen in the physical body as hardness and inflexibility; helps one turn antagonism for oneself or one's illness into awareness and acceptance. For emotional excitement associated with fear. cycles of earning and experience. intimacy with oneself and others. traumatized; rebuilds the web of etheric energy in areas disrupted by surgery. body; works with the lower chakras to awaken higher impersonal love. to our true work on the planet. of energetic connections that support the realization of our life goals. us physically manifest a warmer, more feminine quality of spirituality; promotes an easy acceptance of rather than a hard striving for the spiritual realm. over imaginative and given to fantasy.